The gift of being your own boss. The power to choose your own working hours. Spending more time with your family and loved ones. To get revenues without leaving the comfort of your own home. To explore the world and to take your business with you. To make enough dough to fulfil your dreams, and make your loved ones happy. To have money left to contribute and make a difference in other people's lives. To create your ultimate lifestyle, to have it anyway you like. Today, with 1.5 Billion people using the internet, you have the choice to build your dream through an internet business. This web site is here to help you. 20 years ago nothing I do today would have been possible – because the internet wasn't there. I've been in sales and offline marketing since 1987. My successful pre-internet life included cold calling and cold visiting businesses, attending business meetings, driving thousands and thousands of miles each year on crowded highways, working 14 hours a day – 7 days a week. 2001 I built my first web site and over time steadily moved from offline to online. Today I don't do any business offline anymore. Instead I run web sites in German and English language selling software, info products and internet marketing services. I have the freedom to travel, to outsource my work, to be my own boss, to chose the customers and the projects I want to work with. That’s how I made my dreams come true. You can do it too. Decide what you want. Then re-arrange your life to make it happen. I rearranged my own life to fit my dreams – and now I'm here to help you achieve the same. In a world of information overload I appreciate your visit, and I sincerely hope it's worth your time. The blog is relatively new, and it's my intention to build a huge resource for your online success. bookmark this blog to your favorites. subscribe to the RSS Newsfeed. P.S. This Blog isn't really about me, it's about you – because you too can enjoy the freedom of an internet business, or, as I like to call it, create your own "Portable Internet Empire". 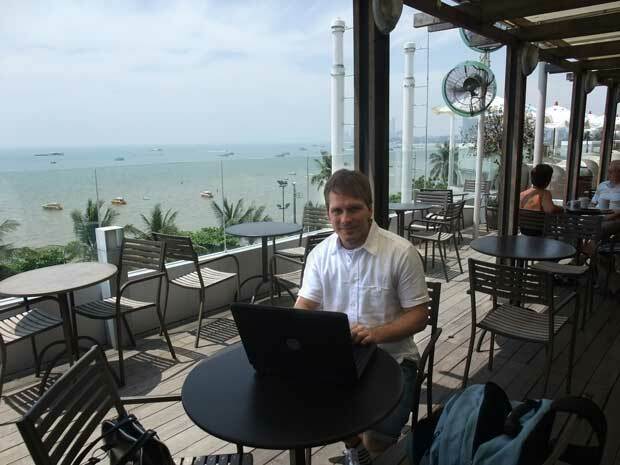 Below you see me working at Starbucks at Royal Garden Plaza in Pattaya, Thailand. This year I alternate between Germany (my home) and Thailand in bi-monthly intervals. In a year or two I might chose another place to travel to.